Daisy Award winner Sabrine Mbarkah, RN. 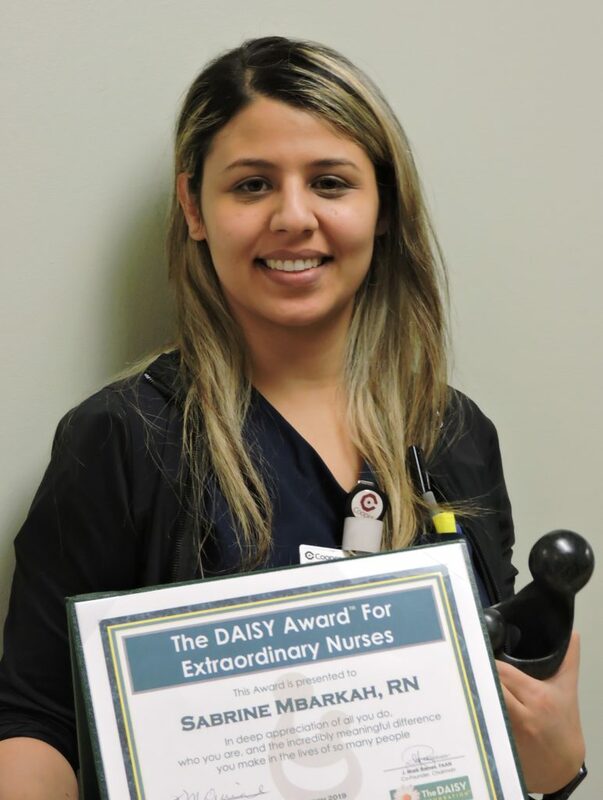 Cooper University Health Care recently recognized Sabrine Mbarkah, RN, of Palmyra, NJ, with the DAISY Award for providing exceptional nursing care. Mbarkah works as a cardiac nurse in Cooper’s Kelemen 8 nursing unit. She was nominated by the family of a patient for going above and beyond to advocate for their loved one while he was hospitalized and undergoing testing at Cooper. The DAISY Award, established by The DAISY Foundation, is an international program that celebrates the extraordinary care given by nurses every day. It is presented in collaboration with the American Organization of Nurse Executives. Anyone—patients, families, and professional colleagues—may nominate a Cooper nurse for The DAISY Award. The DAISY nomination materials are located on nursing units and other public locations throughout the Cooper Camden campus and outpatient offices, as well as online through the Cooper website. Click here to learn more.